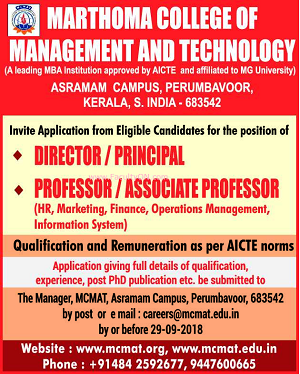 Marthoma College of Management & Technology, Perumbavoor has advertised in THE HINDU newspaper for recruitment of Professor / Associate Professor / Director / Principal jobs vacancies. Interested and eligible job aspirants are requested to apply on or before 29th September 2018. Check out further more details below. About College: Marthoma College of Management and Technology was established in 2005 as a full-fledged business school. The College has ‘Minority Educational Institution’ status granted by the National Minority Commission for Educational Institutions, Government of India. MCMAT, one of the top MBA colleges in kerala offers MBA program affiliated to the Mahatma Gandhi University, recognised by the Government of Kerala and approved by the All India Council for Technical Education (AICTE). How to Apply: Interested and eligible candidates are requested to send their application giving full details of qualification / experience / post Ph.D publications and recent PP size photo in resume to the following postal address or email address.